IT’S ODD IF people describe the Nō performances as a thing that is simple or unsophisticated or unelaborated. The poem, to begin with, is not simple; but it has a lyrical slenderness which wouldn’t, one would guess, lead anybody to think of going to such lengths as to distribute its recitation among a chorus and actors, thus requiring perhaps eleven men to say the words, with two or three drums and a flute added, and masks and costumes fit for a museum, and angelic properties, and special stages, and attendants to wipe, in hot weather, the sweat from immovable hands and from under chins. The volume of what goes to a performance is large, but it’s all cut down outwardly and bent inwards. As for the recitation, the first necessity is to eliminate direct expressiveness in the saying of the words. This seems obvious in the saying of any good poetry. The chorus chants (it’s rather like a Gregorian chant), the actors intone. Both may come to singing, only not with any tune that might carry you off by itself. Yet, within the limitations of intoning, with some turns, the actor taking the women’s parts will achieve a pitch of pathetic intensity beyond the reach of one who sings words to an air that has an existence of its own, or who recites with meaning. The Nō actor is not directly expressive, it’s always the poem he is doing and throwing you back on. The No performer intensifies the poet’s fancy; he turns the mind of his audience in upon the masterpiece of words, rhythm and poetical fancy. I suppose the mask may have originated in a priest’s needing to impersonate an angel or a beautiful girl, or an evil spirit; but its justification, as against make-up, is absolute for the Nō purpose. I saw in the same week Funa Benkei, adapted for the theatre, at the Imperial and on a Nō stage. At the theatre, the part of Shizuka, the mistress whom Yoshitsune the pursued young lord is persuaded to send away, was taken by Baikō. It was one of his nights, and all the evening as three different women and a ghost, he was so that I shall not again ever so much care about a beautiful woman taken by a beautiful woman. But in the theatre version of Funa Benkei, Shizuka wore no mask, and when she pleaded, Baikō, of course, acted; it was charming; but Heaven knows what words he was saying—certainly he was not turning the mind of his audience in upon any masterpiece of words, rhythm and poetical fancy. He was acting the situation. The Nō performer, on the other hand, is intensifying the poet’s fancy. From sight of the masks hung up alone, I had not imagined how well their mixture of vacancy and realism would do the trick. The masks are not wayward, not extravagant (even the devil’s masks are realistic); but they are undoubtedly masks tied on with a band, and they effect the purpose of achieving an impassive countenance of a cast suited to the character—impassive save that, with a good actor and a mask of a beautiful woman that just hits off the balance between too much and too little physiognomy, I’d swear that at the right moments the mask is affected, its expression intensifies, it lives. 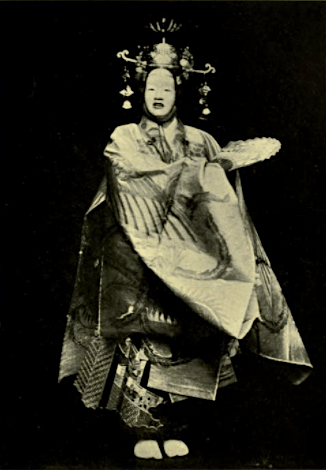 THE COSTUMES ARE tremendous, elaborate, often priceless heirlooms; but again they are not extravagant, ‘on their own,’ being all distinctly hieratic (as indeed is the whole performance, a feature historically deriving, maybe, from its original source among priests, but just what one would desiderate if one were creating a Nō performance out of the blue), because the hieratic helps to create and maintain a host of restrictions and conventions which good taste alone, even in Japan, could scarcely have preserved against the fatal erosion of reason. The masked actors of beautiful women are stuffed out and by some device increase the appearance of height, though all go in socks and apparently with bent knees. The great masked figure, gliding without lifting the heels, but with all the more appearance of swiftness, to the front of the stage, is the most ecstatic thing to sit under, and the most that a man can do to act what people mean by ‘poetical,’ something removed from reality but not remote, fascinating so that you fall in love with it, but more than you would care to trifle with. This movement occurs in the dances which come in some plays—I think always as dances by characters invited to dance—and which are the best moments for the stranger, since then alone does the rhythm of the drums become regular enough for him to recognize it. For that is really, I am sure, the bottom essential of the Nō representation—the rhythm marked by two drums. For quite long intervals nothing else occurs. No actor is on the stage, no word is uttered, but the sharp rap sounds with the thimbled finger as on a box and the stumpy little thud of the bare hands follows, or coincides, from the second drum and both players give a crooning whoop. In some way, which I can’t catch, that rhythm surely plays into the measure of the recitation when it comes and into the movements of the actors when they come. You know how people everywhere will persist in justifying the admirable in an art on the ground of the beautiful ideas it presents. So my friends tell me the drum beats suggest the travelling of the pilgrim who is often the hinge of the episode. I feel like a Japanese who wants to know whether a sonnet has any particular number of lines, and any order for its rhymes and repeats, and gets disquisitions on Shakespeare’s fancy which might also apply to a speech in blank verse. Anyway, it is ever so evident that the musicians do something extremely difficult and tricky. The same musicians don’t seem to play on through the three pieces which make a programme. As they have no book (and don’t even look at each other), they must know the performance by heart, and the stranger’s attention is often called by a friend to one or the other who is specially famous for his skill. Some one tried to explain the relation between the musicians and the actors by saying that a perpetual sort of contest went on between them. Certainly there seems to be in a Nō performance some common goal which has to be strained for every time, immensely practised though the performers are. During the dance this drum rhythm speeds up to a felt time, and at moments of great stress, as when an avenging ghost swims on with a spear, a third drum, played with sticks, comes in with rapid regular beats, louder and softer. Sometimes when the beats are not so followable, but anyway quicker in succession, I seem to make out that they must be involving themselves in some business of syncopation, or the catching up and outstripping of a slow beat by a quicker one. But the ordinary beats are too far apart for me to feel any rhythm yet. The Nō actor works at an intense and concentrated pitch of all his thoughts and energies, and this tells through his impassive face or mask and all his clothes and his slow movements. THE BEST SINGLE moment I have seen was the dance of thanks to the fisherman who returns to the divine lady the Hagoromo, the robe without which even an angel cannot fly. It seemed to me an example of the excellent rule in art that, if a right thing is perhaps rather dull or monotonous lasting five minutes, you will not cure the defect by cutting the performance to two and a half minutes; rather give it ten minutes. If it’s still perhaps rather dull, try twenty minutes or an hour. This presupposes that your limitations are right and that you are exploiting them. 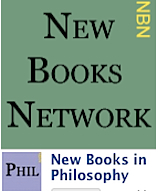 The thing may seem dull at first because at first it is the limitations the spectator feels; but the more these are exploited the less they are felt to be limitations, and the more they become a medium. The divine lady returned on her steps at great length and fully six times after I had thought I could not bear it another moment. She went on for twenty minutes, perhaps, or an hour or a night; I lost count of time; but I shall not recover from the longing she left when at last she floated backwards and under the fatal uplifted curtain. 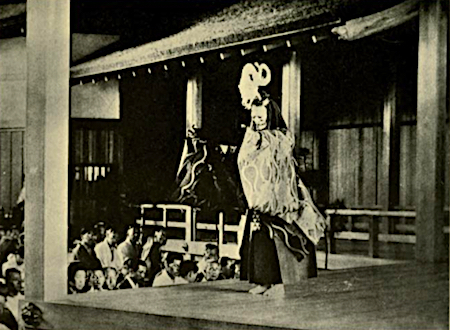 The movements, even in the dance, are very restricted if one tries to describe or relate them, but it may be true, as they say, that the Nō actor works at an intense and concentrated pitch of all his thoughts and energies, and this tells through his impassive face or mask and all his clothes and his slow movements. Certainly the longer I looked at the divine lady, the more she seemed to me to be in action, though sometimes the action, if indeed there, was so slight that it could only be that she had worked us up to the fine edge of noticing her breathing. There was only one memorable quick motion in the dance, the throwing of the stiff deep gauze sleeve over the head, over the crown with its lotus and bell tassels. My wife has no inclination to deceive herself with the fascination of what she can’t explain, and she agreed that this was the most beautiful thing that had ever been seen. YOU WILL SEE the two drum players in many of the cards. With them sits the player on the fue, a transverse flute, who joins in at moments with what often is, if you take it down, the same phrase, though it sounds varied as the player is not often exactly on any note that you can take down. The dropping of the flute’s note at the end of the phrase, which before always went up, is the nearest approach to the ‘curtain’ of the theatre. It is very touching. The poem has come to an end. The figures turn and walk off…. I have been to more Nō performances, always with increasing recognition of the importance attaching to the beat, a subject on which I have got some assurance from an expert kindly directed to me by a friend. From beginning to end, all the words of every Nō play fit into an 8-beat measure, and a performer who sat in the dark, tapping the measure while skilfully weaving the words, would give a Nō audience the essential ground of its pleasure. If they are not actually being followed on books, in which they are printed as ticks alongside the text, the beats are going on inside (often to the finger tips of) all the people whom I notice to be regular attendants at Nō performances. I saw a play (not a good one) at the Kabukiza in which a Nō master refuses a pupil a secret in his art. For some reason the pupil attaches importance to being shown the way in this difficult point. The master’s daughter takes poison and, in fulfilment of her dying request, the master consents to show the pupil. It was no subtlety of gesture, no matter of voice or mask, that brought things to such straits. The master knelt at his desk, and, beating with his fan, began reciting a passage, showing how the words were distributed in the beat. It is very seldom that every beat in the eight is marked by a drum. I don’t think this happens save in those plays where the taiko (the real drum played with sticks) takes part, generally in an important or agitated dance. In the ordinary course, only certain of the eight beats are marked by the two players on the tsuzumi (one held on the knee, the other over the shoulder). The Japanese get much more out of subtleties of rhythm (or, rather, out of playing hide-and-seek with one simple rhythm) than we do and are correspondingly lax about the interval between one note and another. I don’t believe a European would have thought of dividing the drum beats between two instruments. It must be horribly tricky to do. This division gives variety, for the big tsuzumi yields a clack and the small yields something between a whop and a thud. As for masks, one would have to see very many performances, I fancy, and think a lot, before one got on to any philosophy of their fascination and effectiveness. As for masks, one would have to see very many performances, I fancy, and think a lot, before one got on to any philosophy of their fascination and effectiveness. 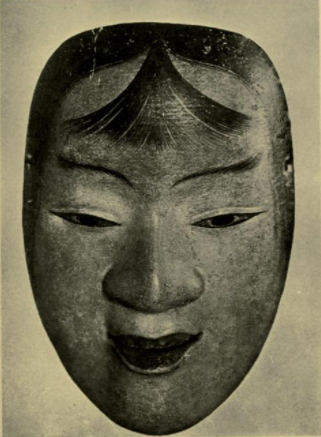 I am always impressed by the realism, the naturalness of the Nō mask. It is not fanciful in any obvious sense. After a few performances, I found I knew when a mask was a particularly good one. My preferences turned out to be precious heirlooms two hundred years old. 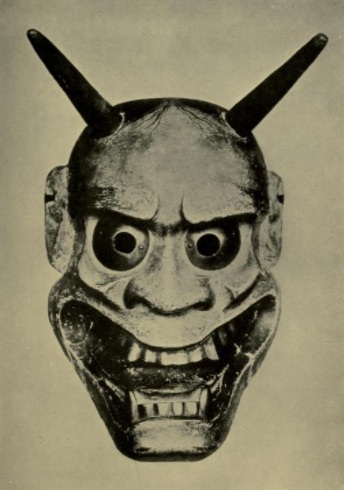 In one instance when, for a reason I don’t yet understand, Rokurō changed his mask after death for another of the same cast, I could not say why the first was better than the second—certainly not for a pleasanter surface, for it was shining like lacquer; I noticed the features were more pronounced. We were allowed the thrill of being let into the room of the mirror, immediately behind the curtain, and saw Rokurō have his mask fitted and make his entry after a last touch by his brother Mansaburō. These brothers are Umewaka, belong to the Kwanze School, and have a stage of their own. I am told that my preference for them is natural to a beginner and that later one likes as much, or better, the more masculine style of the Hōshō. At present Nagashi (Matsumoto), the chief performer of this school (which has a lovely stage and a very aristocratic clientèle), seems to me like an upright gentlemen who has well learned his lesson, while Rokurō and Mansaburō are actors. Both brothers have beautiful voices. The Hōshō people speak with a thickness in the throat. But I know it is absurd for me to feel critical about anything. Moreover, Rokurō and Nagashi would not take the same parts. MIIDERA. A MOTHER, crazed by the straying away of her little boy, is advised by a neighbour any way to go to Ōtsu, for there stands the temple of Mii which she had seen in a dream. The priests of Miidera, with the little boy among them, are out in the temple yard viewing the full autumn moon. The attendant tolls the great bell, whose lovely note waves long over the lake below. The mad mother appears on the scene, and, drawn to the bell, makes to toll it. The head priest forbids her. There follows an argument full of bell lore, and its effect on troubled hearts. She tolls the bell, and mother and son recognize each other. One of the cards I sent shows the mother tolling the bell. She comes on first in a red flowered robe, is advised by the neighbour and goes off. The priests come on. The sounding of the bell is the hinge of everything, a thing of great sentiment. As it is, in reality, one of the most touching things in the world, it seemed to me clever that there was no attempt to represent it. On the contrary, the action centred in the toller, a cheery old gossiper used to the job, who more or less spat on his hands and said Heave ho as he swung the imaginary horizontal beam. Only when he had done so, he continued his Heave ho in a kind of long echoing hum. Then he danced. The mad mother came on in another dress, very strange, light mauve gauze over white, no pattern, and the bough in her hand. Why, when the old man had already tolled, for one’s imagination, a non-existent bell in the real way with a heavy beam, the mother should actually pull a coloured ribbon tied to an elaborate toy, it is hard to say. But it is right. I saw this taken by Mansaburō, who, like his brother Rokurō, has a beautiful voice. The singing is so unlike ours, that at first one feels nothing about it. But after three or four performances one notices, and I recognized the beauty of both these brothers’ voices before I knew they were brothers, or, indeed, that they were noted in any way. In fact I was still in the state when I had not yet realized that one might come to discussing the merits of these players hidden in robes and masks as hotly as one discusses the qualities of the favourites on the ordinary theatre. I DON’T KNOW if you know about the curtain. Every subsidiary detail of the performance possesses, I don’t know how to say, but a solidity. It’s there God knows how it came there; but there it is, and it’s not a contrivance, not an ‘idea.’ The entry to the stage, as you know, is by a narrow gallery, beside which three little pine-trees rise like milestones. This gallery ends with a single heavy curtain, which does not rise as ours do, or draw aside or fall as in the Japanese theatre. It sweeps back, only bellying a little. It is, in fact, as I saw when I was allowed behind, lifted by poles fixed to the bottom corners. The poles are raised rapidly by two men kneeling a good way behind. Suddenly the curtain blows back as by a wind, and the expected figure, whom you know must be coming or something, i.e. suspense is prepared by what has already happened, is framed in the opening and there pauses an instant. I am speaking, not of the first entry, but of the second one, when the person who aroused the pilgrim-visitor’s curiosity as a temple-sweeper or a water-carrier, and vanished, reappears as the great General or princely Prime-Minister he once was. The stage-wait necessitated by the change of costume and mask is filled in by an interminable sayer of short lines, with the same number of feet, each line detached from the next as if the speaker were going from one afterthought to another. He is a bystander—perhaps a shepherd in one play and a fisherman in another—who knows something, and dilates on it to fill in time. The musicians lay aside their drums. Everybody just waits. Up sweeps the curtain, and with the re-entry of the revealed personage comes the intenser and quicker second part for which the slow first part was a preparation. Oswald Valentine Sickert, brother of the famous painter Walter, attended Cambridge with Bertrand Russell. 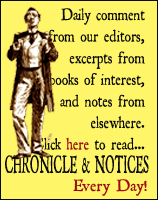 He worked as a journalist, wrote a novel, Helen, and travelled the globe for the Encyclopædia Britannica as an ad-man. These “letters” by Oswald Sickert appear in an appendix to The Nō Plays of Japan (1921) by celebrated Orientalist Arthur Waley (1889-1966). 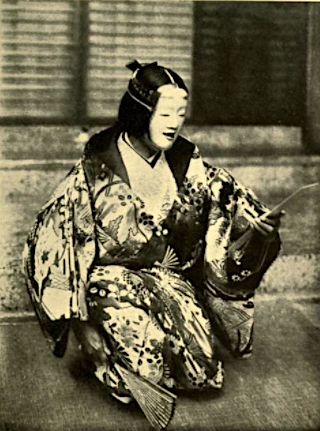 A note by Arthur Waley: The fact that Nō did not disappear with the overthrow of the Shōgun in 1868 was almost solely due to the efforts of Umewaka Minoru (1828-1909), whose ancestors had for generations played tsure parts in the Kwanze theatre. 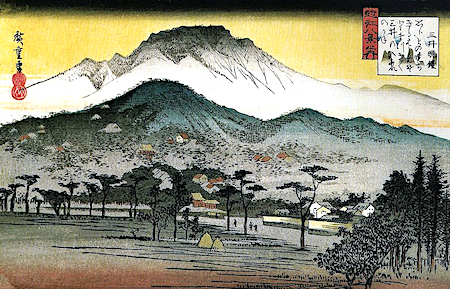 When the Mikado was restored in 1868 Kiyotaka, head of the Kwanze line, was convinced than an art so intimately connected with the Shōgunate must perish with it, and fled to Shizuoka where the fallen Shōgun was living in retreat. Minoru alone remained behind, built himself a theatre — or, according to Fenollosa, bought a stage belonging to an ex-daimyō — (1869-70) and “manned his lonely rampart.” When confidence was re-established the other “troupes” soon returned, so that henceforward five theatres existed, the four of earlier days and that of Umewaka as a fifth. Minoru was succeeded by his brilliant sons, Mansaburō and Rokurō, who in 1919 opened a new Umewaka theatre. As a compliment to the Umewaka family and a tribute to its services, actors of the three other “schools” took part in the opening ceremony, but the Kwanzes refused to do so. The dispute turns on the right to grant certificates of efficiency (menjō) which according to the Kwanzes’ claim, belongs only to Motoshige, the head of their school. Such certificates have, in fact, been issued successively by Minoru, his sons and the “renegade” Kwanze Tetsunojō, who sides with the Umewaka. The validity of Minoru’s certificates was, I believe, never disputed during his lifetime. 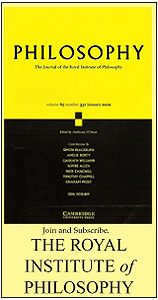 This Fortnightly Review article is filed under the following rubrics: Dance & Performance, Principal Articles. Publication: Saturday, 18 February 2017, at 16:54. Options: Archive for Oswald Sickert. Bookmark the permalink. Follow comments here with the RSS feed. Post a comment or leave a trackback.